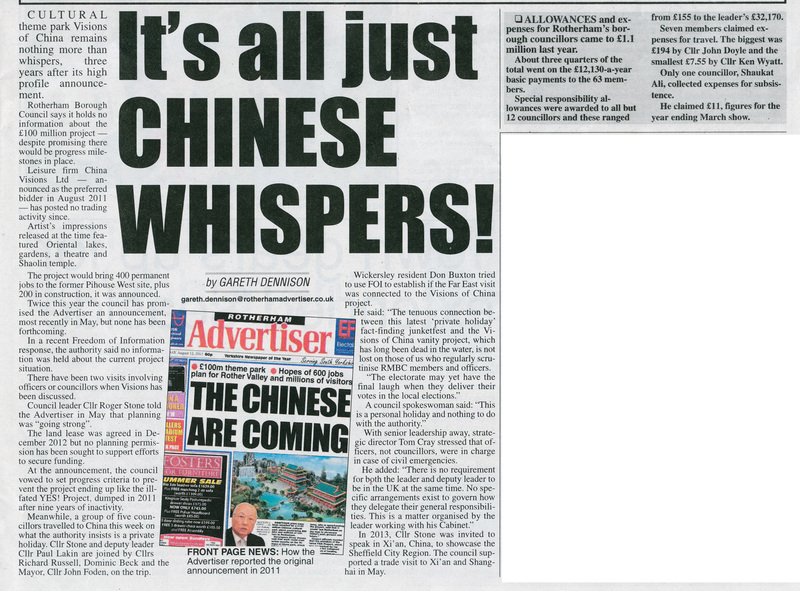 The China trip as told by the Advertiser and the ‘silly season’ short on expenses! This entry was posted in Abuse of power, Councillor Greed and tagged China Jolly, Greed, Ken Wyatt, Labour Chicanery, Labour Party, Paul Lakin, RMBC, Roger Stone, Rotherham Metropolitan Borough Council, Scum Labour, sleaze and corruption, Visions of China Theme Park by Rik. Bookmark the permalink. someone should tell the ‘tizer that Richard Russell isn’t a councillor anymore. Quite right RR but if Stoney wants his mates with him on the junket Stoney gets, so what has that got to do with anything in his and his sycophant’s books? Wallowing in a public funded jaunt requires no scruples to Stoney (or his mates) as they wouldn’t recognise one if it jumped up and hit them. Rothpol did a really good job of buying a copy of the tizer and scanning it, so that he could put it up here for all of us to read without having to pay for a copy. and then having read the article, to comment on it. It must be upsetting that you didn’t read it before you commented. Is this a private or an official visit? There really no in between. It is sometimes considered appropriate in government that a partner may accompany an officer or politician on an official visit, when appropriate e.g. Attendance at official functions where other partners are present. But save for the highest diplomatic levels this is rare. However a trip is always either private or official, and if private all costs and organisation must be covered by those going, indeed it is not even a council matter. If public, you have to make a good case for all those going, officials even, and this would certainly exclude non Council staff or politicians. Are Rotherham Council staff or staff/directors of a company with whom Rotheram Council are or are considering doing business in any way involved in the organisation of this tour? Either through booking transport or accommodation, coordinating and briefing those going, or in arranging meetings, visits, fraternal exchanges or hospitality? If this is the case, then regardless of their covering some expenses, this must either be an official visit or it is corrupt and an abuse of power. The article says that RMBC says that are going on a “private holiday”. So let’s conjecture – just for the fun of it – that during Cllr Stone’s earlier visit to Xi’an he gave someone locally the names and addresses of some people he knew in UK. And lets say they later received some airline tickets in the post – as an unsolicited gift, or maybe as a prize in a competition they had each been invited to enter. Would they then have to declare it , and where? Surely not in the Gifts and Hospitality Register? Cllr Stone has never needed to declare a item for entry to his Gifts and Hospitality Register since 18 August 2010. I like the Chinese; I love the way they exploit the corruption among us gweilo. House of cards time folks, keep digging, a targeted FOI, gossip from those not on the trip, those at risk from UKIP in 2015. One more push and the whole house will come tumbling down! Or maybe Rogers getting the equivalent of a Chinese freedom of the town ?? Xi’an has over 8 million people – it’s as big as London, and growing faster. Wonder what the Government of China would have to say about this being ‘a private holiday’? Most of not all governments will facilitate something like this, but then comes pay-back time. So being new here, I’ve no idea were to dig ! Or who knows who. So that leaves me out , but I do hope some of you on here have some idea .